Cumbria’s LGBT community can often feel isolated and excluded, with many people hiding their identity. Others experience discrimination and even violence and this can affect their health and wellbeing. 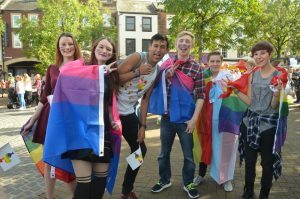 Cumbria Pride, founded in 2010 and based in Carlisle, was set up to promote equality and inclusivity and represent people who are lesbian, gay, bisexual, and transgender (LGBT) in Cumbria. The first Cumbria Pride event was held in 2011 at the Swallow Hilltop Hotel with help from £1,000 from the Cumbria Fund and has since become an annual event, receiving £2,000 from the Cumbria Fund in 2016 and £2,000 from Cumbria Grassroots Grants in 2018. 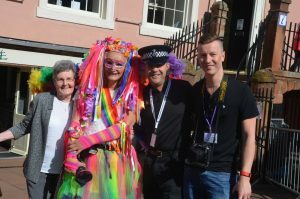 The family-friendly one-day festival brings people together in a celebration of diversity and works alongside Pride in North Cumbria (PiNC) and OutREACH Cumbria to provide a multi-agency approach. It helped create Carlisle’s first dedicated LGBT venue on Victoria Street; providing people with space where they can feel safe and have access to services, advice and support. 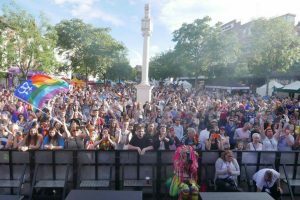 The main aim of the event is to bring the LGBT community together to celebrate and raise awareness to the wider community, providing entertainment and fun activities for everyone to enjoy. Chair and Founder, Pam Eland, said: “The 2011 event was the first large event of its kind in Cumbria and attracted around 500 people. It helped raise awareness of issues that affect the LGBT community and gave people the chance to speak to organisations about the services they offer. Since its small beginnings in 2011, the event now attracts over 4,000 people and has become a main event in Carlisle city centre.